Once the siren wails the children have about 15 seconds to run to the nearest bomb shelter – the approximate time between the siren and the time an incoming missile would strike. Before Operation Cast Lead, this consisted of a staggering 30 to 50 such “events” per day. Those few seconds, before the all-clear siren sounds, are, Dan suggested, not so much by his words but more by his expression and demeanor while relating the story, the most terrifying. If One Extremist Gunman Can Do So Much Damage in America, How About Ten Million Such People In The Middle East? This is what we all need to hear more about. You and IsraeliNurse should start reporting what the mainstream media doesn’t, and give us real Israeli perspectives we never read or hear about outside of Israel. In December 2009, I visited Sderot with my wife and two friends. 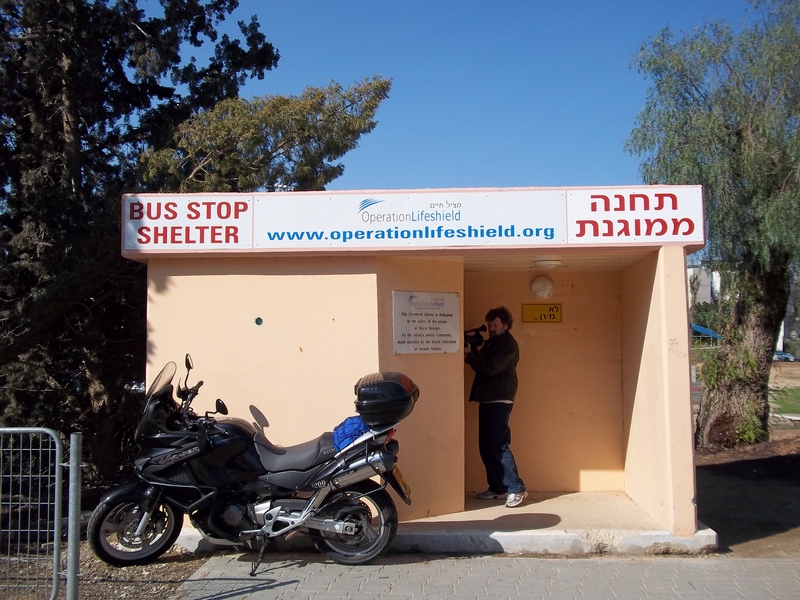 Sderot is a very quiet town – there are hardly any people walking or driving around and I imagine that when the threat of an airborne missile is there all the time, it must have a terrible effect on adults and children alike, who need to be near a shelter. I’m not surprised that Dan is plagued by nightmares. Many kids have all kinds of psychological problems as a direct result of living just 850 metres and 15 seconds by missile from Gaza. and worse it isn’t only the older ones, the small ones who will have no conscious memory will nevertheless have gotten infected by the fear the adults feel. Thank you for this, Adam. I heartily endorse the first comment here. Hamas et al can do what they do, to their own people as well as to Israelis and Palestinian children, because they perceive them to be objects (and this shows the extent of their pathology). So caught up is the “liberal” MSM in the notion Palestinians as the sole victims in the conflict that they, too, objectify the poor Palestinian children who are used as propaganda by Hamas and the PA, and ignore the damage being done to children on both sides. Young Dan appears to me to have the symptoms of post-traumatic stress disorder and that is scarcely surprising. An account of the psychological effects of having to live under kassam and other shell fire from Gaza can be found at http://www.sderotmedia.org.il/bin/content.cgi?ID=258&q=6&s=17. It makes chilling reading. As chilling, is the utter lack of compassion for its own children of Hamas and its henchmen. There can never be a future for them until they value their future, and children are their future. This is such a sad story. The MSM won’t tell this story because it’s simply not an issue for them. They claim that only the Palestinians are the victims. The Palestinians voted for Hamas and they didn’t do that because they wanted better education or health care, they did it because they want jihad. They want death and destruction. This story makes me want to cry, it’s just horrific how kids have to grow up. What’s even more horrific is that nobody seems to care. Wouldn’t be great if the children of Gaza had 15 seconds warning of an attack and be able to take shelter from Israeli bombs & missiles. mostly gutless, wouldn’t it be great if children, women and men had warning of islamofascist suicide bombings that take place all over the world? It is due to islamofascism that every airport in the world needs checkpoints to weed out islamofascist terrorist jihadis. Reading mostly harmless posts I have a feeling that anti-semite hate can seriously damage braincells simply making it impossible to differentiate between cause and effect. What is anti-semitic about wanting children to be protected from bombs and missiles? At least Israelis have the option to move away from the firing line. The Gazans have no such choice. to where? to where they “came from”? with rockets soon able to reach Tel Aviv? a lot of moving that’ll take with the IDF being on increased alert on the other end, maybe the best solution would be to make them all live in busses that constantly shuttle back and forth while trying to avoid missiles. I guess you’d find that a suitable way to deal with the problem. I don’t think there would be a need to go to Tel Aviv, just far enough away for the interceptor missiles to have time to engage and take out any incoming rockets. when have you last done any mundane job, like taking out the garbage, cleaning your kitchen floor, anything that has the ability to connect you back to real life? Brits were not so long ago not so squeamish themselves and I am grateful to them for that every day because it gave me a life in a free speech Burqa-free democracy instead of a life under the boots of wannabe clean-blooded Aryan nutters. and when I read quotes from “them” then they may vary the theme, but the core is the same, nutters dreaming the dreams of supremacism. Mostly clueless – and seeing as rocket and mortar fire from Gaza has been going on for around a decade now, you would, one presumes, suggest that the affected residents remain away from their homes, businesses, schools etc. for how long precisely? And yes, it would be lovely if Gaza’s children had air raid shelters. Indeed, if their government cared a jot about them, it would have built such facilities long ago – or stopped firing rockets into an adjacent country. if those Gaza top honchos cared about their “little” ones one iota they would have stopped firing rockets ages ago but something tells them that to uglify their women compatriots is more important than peace for their children. BTW not so long ago I trawled the net thinking I might find beautiful scarves on one of these modest muslima sites – no such thing, cheap polyester is all they had, no wonder when they must support the nutty rocketeers.